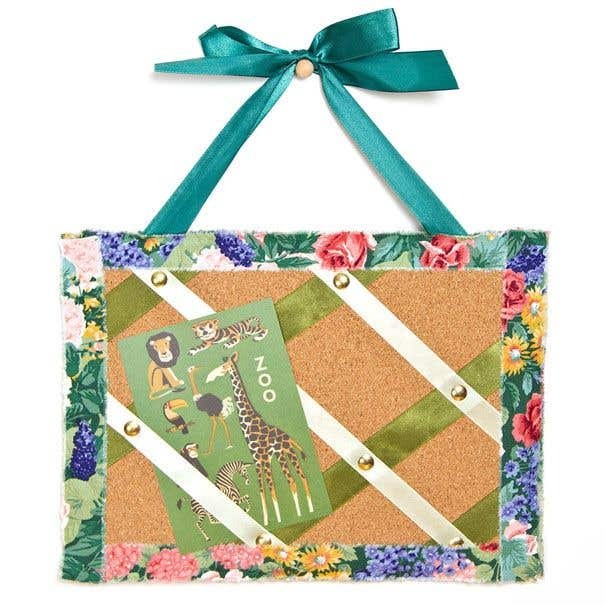 Use this beautiful lightweight organiser and pin board to keep things in check! Measure and cut a piece of foam board the same size as the sheet of self-adhesive felt. Use a very sharp knife, ruler and cutting board to get nice smooth edges. Carefully peel back the backing on the self-adhesive sheet a little and start to apply it to the foam board. It is quite delicate so take your time. Smooth it down as you go. 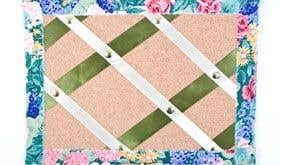 Choose and cut 8 or so ribbons to cross over the front of your cork board. They need to be long enough to wrap over to the back and be secured at both ends. When you have decided where you'd like them, stretch them into place and secure on the back with a piece of sellotape. Add the hanging ribbon too and secure with tape in the same way. Take another piece of self-adhesive cork and apply it to the reverse, covering up the ribbon ends. Again, take your time, smoothing down bit by bit. Using acrylic, give the cork two coats of a light green base. Let the paint dry between coats. 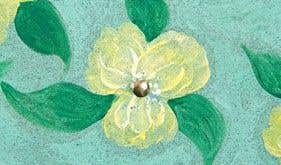 Using the picture as a guide paint on pretty washy florals in lemon and white. Allow to dry thoroughly. 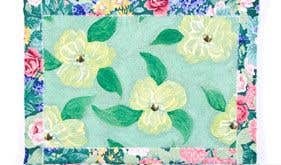 Using some lovely fabric, rip 2cm strips. Pull off any excess threads. Use as a border around both sides of the board. Fix with double sided sticky tape. To finish off, use gold pins in the centre of the flowers and where all the ribbons cross on the other side. Handle the cork very gently - it is quite delicate!